Nebula Exchange is the only cryptocurrency exchange that gives users access to news, analysis, research tools and social networking on a trading platform. Their unique review, reputation, P2P messaging, news and research features set us apart from competitors that only have price and volume data on their platforms. It eliminates the need for keeping a tab on multiple social media outlets and sorting through tons of noise to get investment-worthy information on a project and increase community engagement on the platform. For accredited and institutional investors, it will be one of the first exchanges to support security tokens. Nebula Exchange is designed as an exchange whose aim is to offer support to digital currencies that have a hard time being listed elsewhere. The exchange was launched towards the end of February with a new and innovative reputation system. The Nebula fee is just a 0.1 percent fee and a small taker fee combined with affordable listing fees. The Nebula exchange is eyeing to take over the niche market of projects that have been orphaned due to lack of funding in the last two years. The Nebula exchange also comes with a reputation system, which will allow users and the traders to rate projects. This system will work in a similar manner to how goods are usually rated on e-commerce sites such as Amazon. Scams, pumps and dumps, worthless projects, and projects with no clear business plan are going to get poor ratings. This will help casual traders and newcomers to have an easy way of segregating the chaff from the wheat. When a project gets a high rating, it will be rewarded by getting a spot at the front page of this exchange. The result is that it will get better exposure to investors and traders that utilize the exchange. To display these exchanges, a huge nebula cloud, which will have the logos of the top 20 exchanges, will be displayed on the front page. There has been a lot of criticism from the global crypto coin world over exchanges being quite restrictive about their structure and legal registration. However, Nebula is not one of these companies. The exchange is fully compliant KYC company, which is registered in Singapore with the ChainTrade Company. ChainTrade already has a working commercial business, which enables the trade of commodities on the blockchain such as produce and raw materials. In light of recent hacks of crypto exchanges with some hacks leads to the loss of over $500 million, Nebula has some very tough security measures in place. It has implemented a multi-signature system, which will ensure that the funds from users are operated. They also operate a cold storage wallet, which stores funds offline. On current and leading exchanges such as Bitfinex and Binance, it is quite difficult for digital currencies with a small market cap and shallow order books. This is because large exchanges tend to list digital coins, which have an opportunity to attract more buyers and traders. The result is that digital currency traders rely on exchanges such as OKEx and Huobi for coins with a small market cap. According to the development team working at the Nebula Exchange, this exchange was built with orphaned projects in mind. These projects have been unable to find an affordable listing. It is going to support digital currencies and blockchain projects abandoned by digital currency trading platforms. Some of the major exchanges have a listing fee that ranges from $50,000 to over $500,000. This is a figure, which small projects cannot afford. Nebula exchange is the only cryptocurrency exchange that focuses on community-based aspect where people can grow wise by sharing crypto-knowledge. Listing a new coin on this innovative platform is fairly simple. The proposer of the new coin has to fill a form which asks for the information of the proposer and the coin to be listed. The details of the coin such as if the token is ERC20 or ERC223, whether it is security or utility token, does it have a whitepaper, etc. 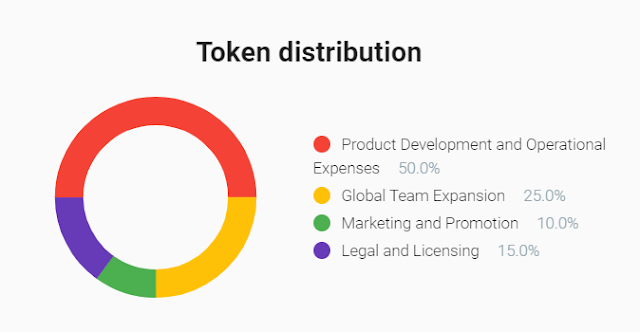 Once the details are provided, the nebula team send an email with tentative cost which are then finalized after mutual agreement. Nebula Exchange lists more than 60 coins on its trading platform. Some of the prominent coins include Relex, Power ledger, Storj, QChain, Gnosis, Loopring, PolyMath, EventChain, Deep Gold, Caviar, Eos.io, ESL Coin, Upfiring, Hurify, Hashgains, Lamden, Modum, among many others. The users on nebula exchange platform can avail 50% discount on transaction fees in NESC. The new listings will be charged in NESC tokens. Nebula Exchange will use 25% of its profits to buy-back NESC tokens and burn them till they reach reached 50mn NESC tokens in distribution. In spite of the little promoting inadequacies of the undertaking, the site and documentation look average and have a decent potential for a fruitful section into the world market. Above all – the group as of now has an extremely working venture, there is something that they can truly indicate financial specialists. Enthusiasm for the task is quickly picking up force, and fuel its expanded level of security, guaranteed by the group of its makers.